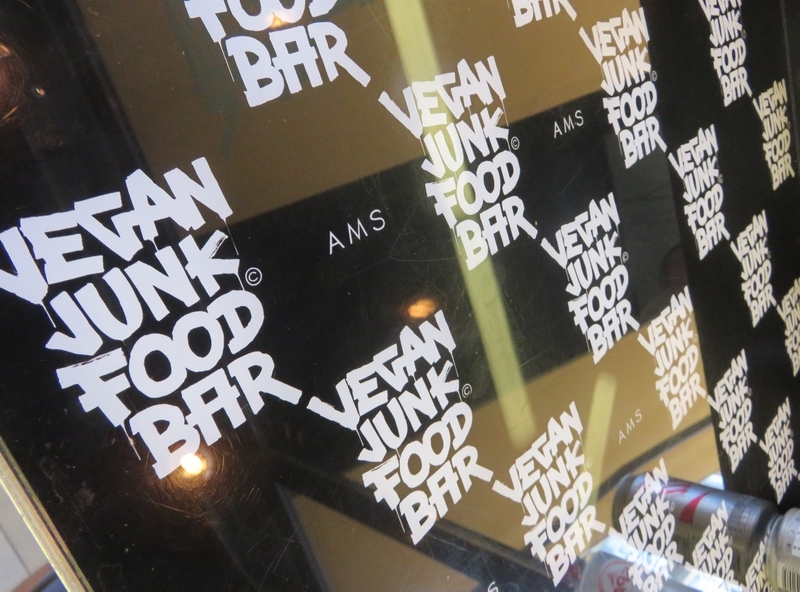 restaurant review #124 – Vegan Junk Food Bar is a new place in Amsterdam (opened Spring 2017). 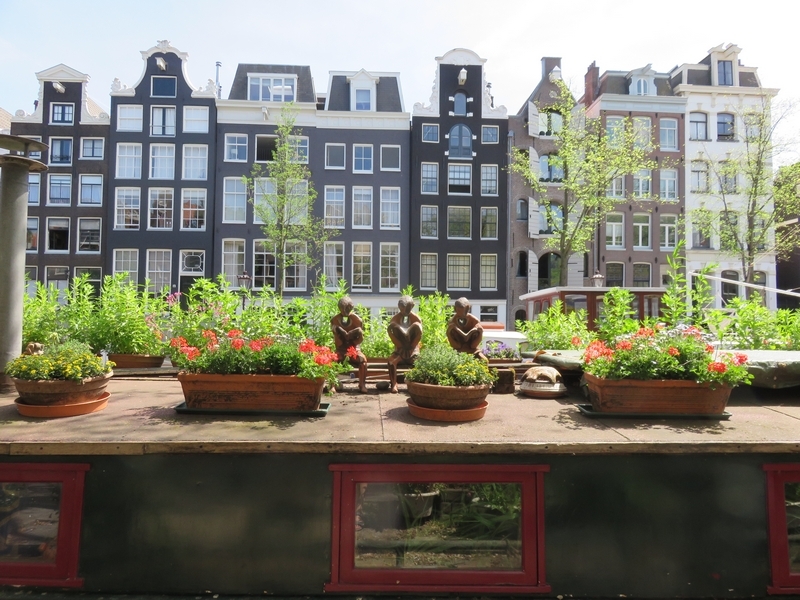 It is located just north of the Vondelpark, overlooking a quiet square. There’s a small terrace in front of the restaurant and some beach chairs. 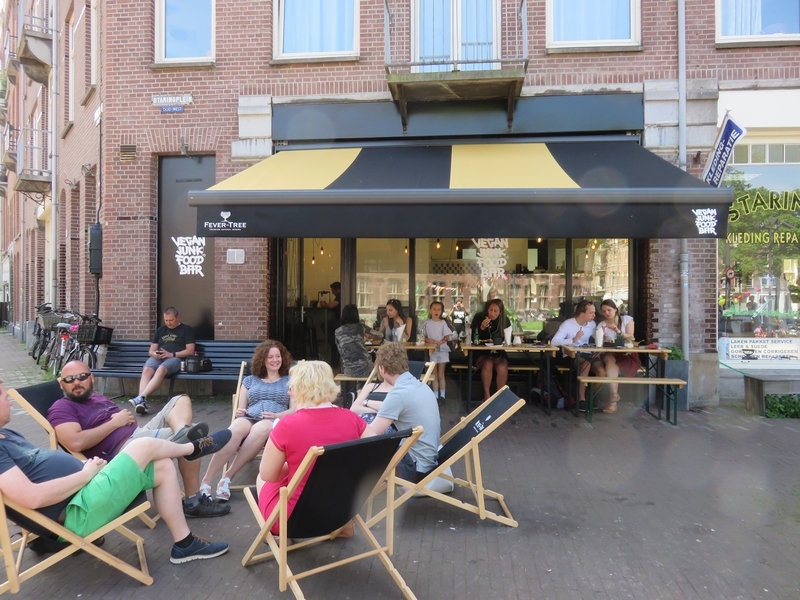 When we arrived, all seats were taken, but soon after, some people left from the terrace, and we could sit outside (it was a very hot day in Amsterdam and we were glad to be sitting on the shady terrace!). 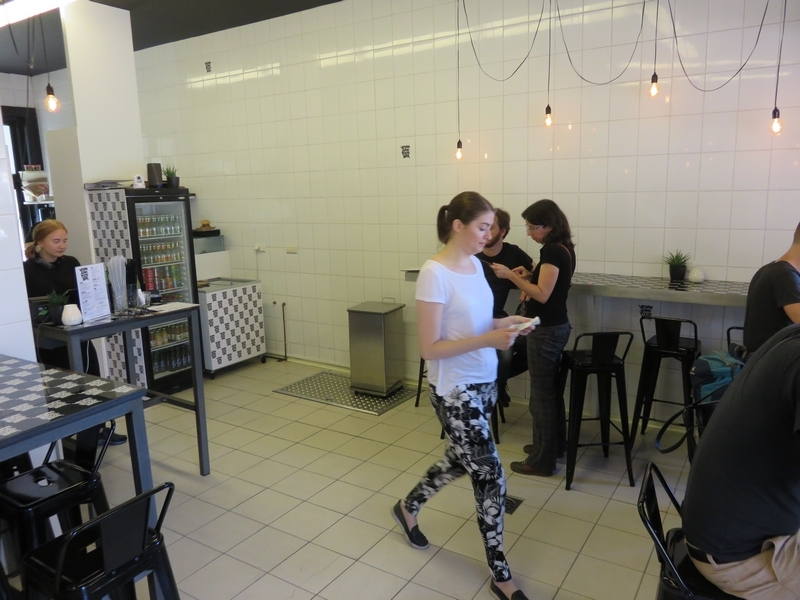 It is semi self service: one orders at the counter and then the food is brought to your table. 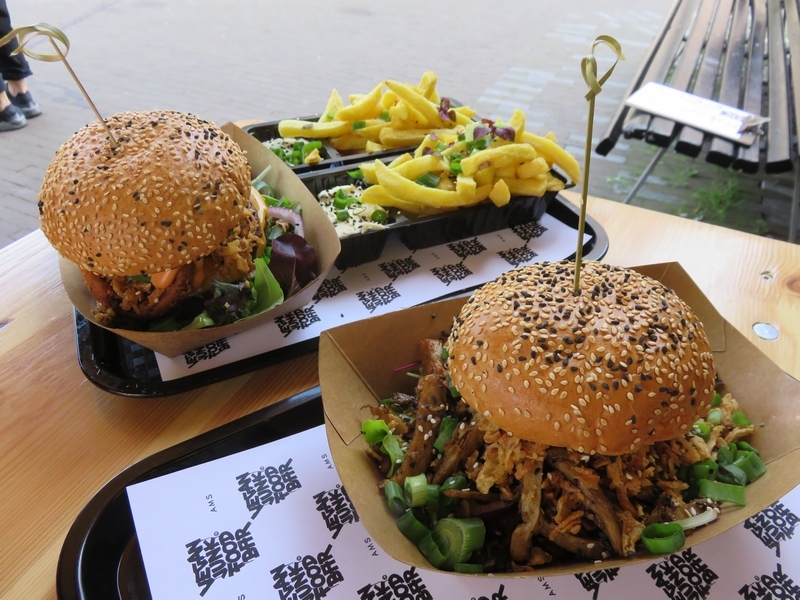 This is what we had: a double sumo burger (9,50€, with two burgers, cheese, fried onion rings, lettuce, baked onions and sauce) and the shoama sandwich (8,50€). Two portions of fries on the side, one with mayo and one with garlic sauce (3€ + sauce 0,75€, each). For drinks we had several lemonades and a coke (ranging between 2,50 and 3€) as it was so hot! I don’t think there was any alcohol served. We absolutely loved the food! Crispy and also with a good portion of vegetables. 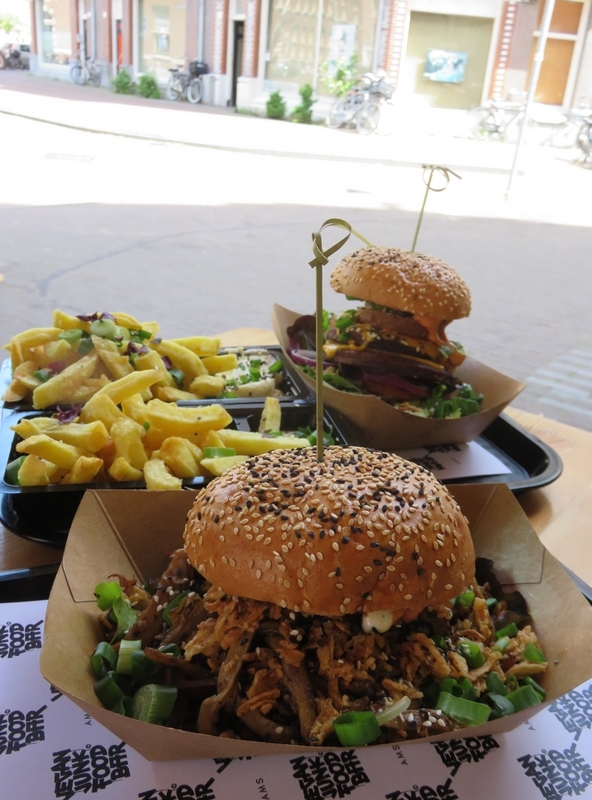 The double sumo burger was (as could be expected!) a huge portion and the shaorma sandwich was also quite a lot! So definitely good value for money. 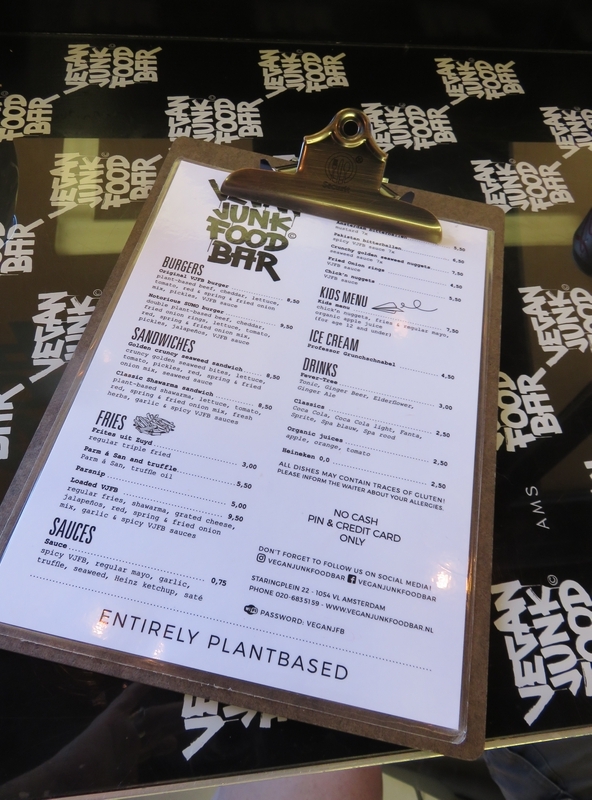 Vegan Junk Food Bar looks newly renovated and has a trendy ‘light’ look. 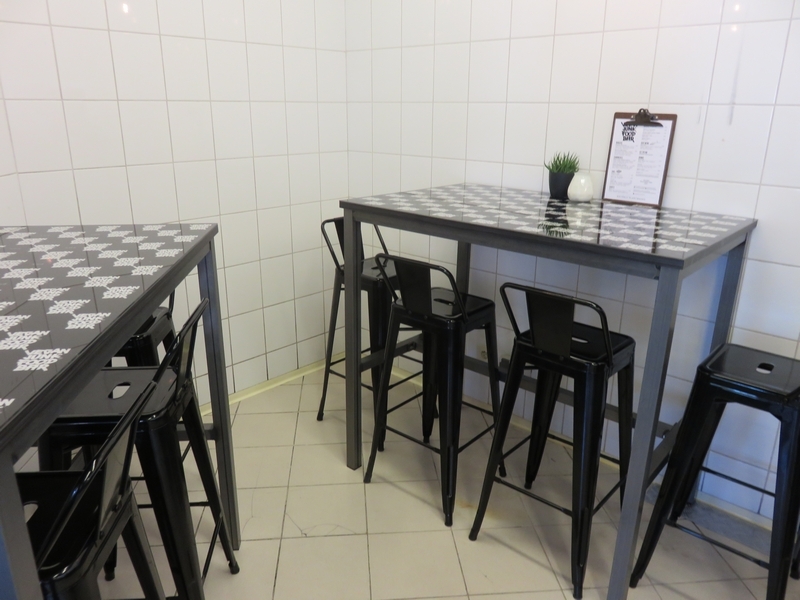 The seatings were – as is the case in many fast food joints – a bit uncomfortable. There are only high bar chairs inside (not so easy for people with mobility issues) and benches without back support outside. 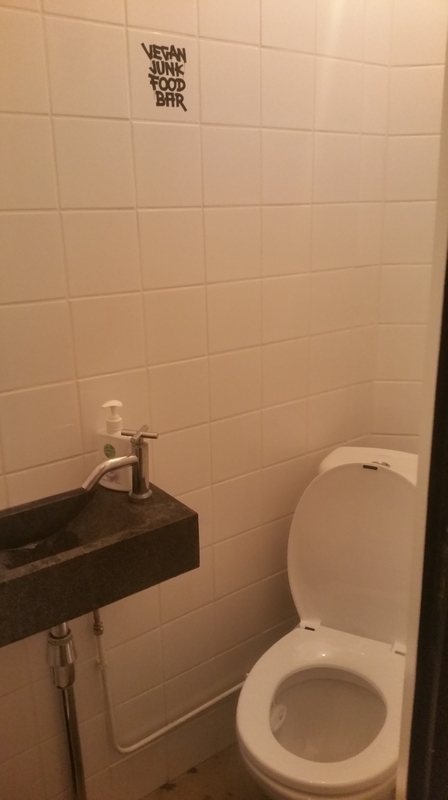 The toilet in the back was extremely small and could use some upgrading. Didn’t find anything to dry one’s hands. Beware: No cash, pin or credit card only. Interesting. The inside of this place looks surprisingly similar to V. Revolution in Manchester before their recent move to new premises. I think that’s a possibility, yes !